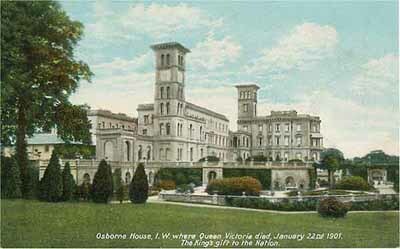 Queen Victoria purchased the Osborne Estate in October 1845 from Lady Isabella Blachford. The house was a three storied Georgian property with views across the Solent. The house was too small for the Victoria's family and it was decided to replace it. The replacement house was designed in the Italian Renaissance style by London architect and builder Thomas Cubitt, his other work included building the main facade of Buckingham Palace; Prince Albert assisted in the design of the house. The new house was built between 1845 and 1851. The estate grounds extend to the beach at Osborne Bay where the Queen had a bathing machine for her to swim in the Solent. The Swiss Cottage in the grounds was built for the royal children to play at housekeeping and includes scaled furniture etc. There are numerous cottages and smaller buildings on the estate for the estate workers and other members of the household. Queen Victoria died at Osborne House on January 22, 1901. Following the Queen's death, King Edward VII gifted the Osborne Estate to the nation (although he kept the Barton Estate as a holiday home on the Island). At various times since then, Osborne House has been a convalescent home for military officers and a Naval Cadet College was also located on the estate between 1903 and 1921. Today (2018) Osborne House is in the care of English Heritage and is open to the public.